Sedentary stingers with tasty tentacles. Like people, snakelocks anemones (Anemonia viridis) contain multitudes, in the form of microbial communities living within them. Inhabiting the body of an animal that can defend itself with stings provides zooxanthellae, tiny algae, with relatively safe accommodation. In return the host benefits from a share of the energy they capture from sunlight in the process of photosynthesis. It is a mutually beneficial arrangement in which food is exchanged for housing. Mermaids! Romance! Time travel! Tescos! The April issue of Outdoor Swimmer has it all. 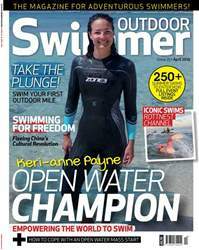 We chat with our new guest coach and cover star Olympian Keri-anne Payne about her coaching philosophy, contributing editor Ella Foote meets some swimmers in a supermarket car park, Elaine Howley tells the story of small and repulsive mermaids and Mike Morris slips through time to meet a Victorian swimming champion. And we have two new regular features starting this issue: Eco Heroes, in which we celebrate people and companies striving to save the planet; and Wild About You, where we play matchmaker for solo swimmers looking for love. Plus Plus, how to train for your first open water mile as well as more long distance challenges, training day menus, swimming with cerebral palsy, a dream swim trip in the Maldives and comprehensive UK and international event listings to help you plan your summer swims.